President Danny Faure this morning launched the first meeting of the Public Service Salary Technical Committee, mandated to advise the President on options for any further amendments to the Public Service Salary Table. The meeting established the scope of work to be undertaken by the Technical Committee, which would include serving as a platform for discussion with interested groups. The Technical Committee would then present various costed scenarios for consideration by the President of the Republic. 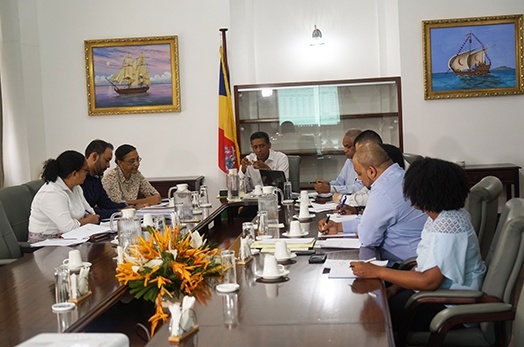 President Faure announced the creation of the Technical Committee on Thursday 11 April, to ensure greater dialogue on this subject of great importance to the public service and to Seychellois is general. Speaking to the Press after this morning’s meeting the Chairperson of the Technical Committee, the Secretary of State for Cabinet Affairs, Mr Mohammed Afif, explained that the Technical Committee would appraise all proposals received to assess their consistency with the Public Service Salary Act, and with the Government’s budgetary framework.